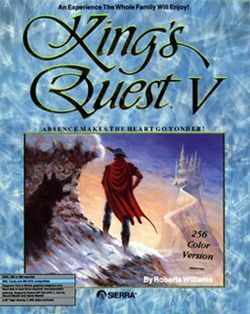 King's Quest V: Absence Makes the Heart Go Yonder! is an adventure game released by Sierra. Released on November 9, 1990, it featured a significant improvement in graphics (achieved through the introduction of VGA into the series) and quickly became the best-selling computer game in history at that time. It was also the first King's Quest installment to replace the typing user interface with a point-and-click user interface, which drew some criticism from some fans of the series who were used to, or simply preferred the keyboard interface. This page was last edited on 9 July 2016, at 19:35.